Are Gene Signatures Ready for Use in the Selection of Patients for Adjuvant Treatment? 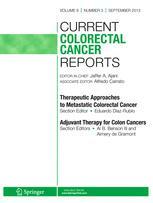 Aspirin and Colorectal Cancer Prevention and Treatment: Is It for Everyone? Is There a Role for Adjuvant Chemotherapy in Rectal Cancer?